After finishing the second JBoss in Bossa I felt the need to push something like this to happen in Buenos Aires. The people here is passionate to go to a paid event during the weekend and enjoy great talks with high technical skills. We definitely need to imitate this motion and push forward to have this community events in Argentina where we can share the community knowledge. It was a great time to meet good friends and enjoy the good weather in Brazilia! I’m sharing here the slides that I’ve used in during the event. I hope next year I can continue sharing the concepts behind Drools and jBPM5 event further. Thanks a lot for coming, your talk was great! Hi. I saw this presentation in Brazilia (live there) and now I’m in Buenos Aires (great place) on vacations. What about the technology jobs here in Argentina? This time I feel Argentina as an expensive country. Is the salaries good? There are good oportunities? Did you miss the JUGAR event? That was a good place to meet people that is doing development. There are a lot of opportunities in Argentina, but the salaries are not that good as in Brazil. I mean, it depends the kind of job that you want to do and where (which company/field) and how much do you want to earn. Enjoy Buenos Aires, I’m not in the city right now but next time we can meet to have a coffee or something! 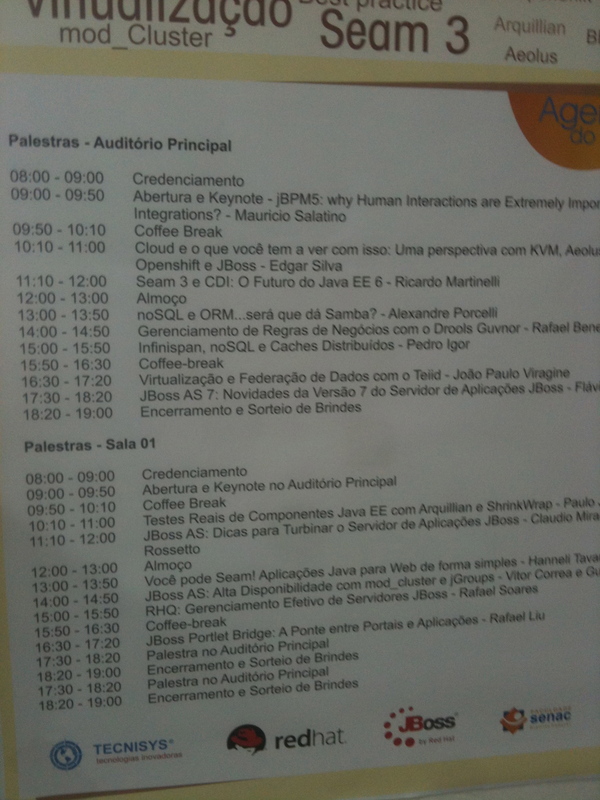 Previous Previous post: Getting ready for JBoss in Bossa!